Stir with ice and strain into a flute glass. Top with champagne (~2 1/2 oz Gruet Blanc de Blancs) and garnish with a lemon twist. Two Mondays ago, I searched through my 1940 edition of The How and When by Hyman Gale and Gerald F. Marco, and there I spotted a curious champagne sparkler that included Fernet Branca in the mix. 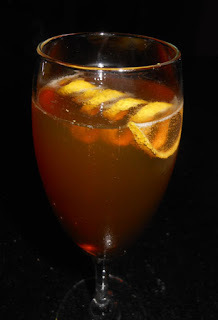 After making the drink, it offered up a lemon oil and candied orange aroma. A dry sparkling wine-laden sip possessed orange notes, and the swallow began with crisp brandy flavors with an herbal, menthol finish. Over time as the Imperial Delight warmed up, the Fernet Branca became more prominent on the swallow.